We have been able to reconstruct a consistent conjecture surrounding the event known as the Pleistocene Nonconformity. We have assembled the ideas over a number of posts and even separate articles over the past two years. We have recently been well informed by the work of Prithvi on the ancient scriptures of India. This has given us eyewitness reports consistent with the core hypothesis of crustal shift. In addition we have found that the evidence also demands that the event was precisely targeted to achieve the final result. This immediately informs us that this shift was brought about by human intervention conducted by space adapted humanity. What this all means is that our human ancestors acted to end the Ice Age and usher in the climatically stable environment known as the Holocene. While doing this, they removed themselves to space habitats through natural conversion to a space adapted human form that we recognize as ET. This background allows us to now review the report that has come down to us from Genesis and in particular the story about Noah. I have attached a recent copy of the story from Genesis and I ask you to read it once you have read through enough of the material I have posted on the nonconformity. I must admit, the story has been fleshing out amazingly well and it is drawing in other cultural sources into a consistent history. First, I want to say that Genesis is a remarkable text. The first several pages lays out a creation myth as rich as any and to which we will return in another post. The next section is the tale of Noah and the great flood and can be viewed as an interpolation from a specific self contained text. Thus we can presume that the first section was possibly assembled from many other texts and perhaps even the later material, Noah’s tale stands out as a self consistent text folded into the material that stands alone. Thus we are able to work with it as external to the natural construction based on ancestral imperatives. Now we move to the text itself. This work has come to us after been translated at the end of the Bronze Age from far older texts. Let me explain what that generally means. Language itself, without a written anchor as presently exists will drift and become unintelligible after about five hundred years. This means it will be translated into current usage about every five hundred years. Thus the only thing that we can trust is the story itself. And reading it in English is well in keeping with that tradition. This also means that our first warning is that the language of transmittal is from the late Bronze Age and we must act accordingly because I am saying that the tale itself is plausibly a report that is now over 12,000 years old. This is very important. 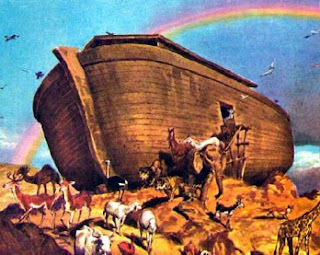 What the tale tells us is that Noah formed a resettlement group with sufficient biological specimens to commence, in his particular case, repopulation of Asia. They built an ark that was obviously no sea going vessel, but a transport globe able to lift off the earth and stand off while determining conditions. Not surprisingly, the tale has been ‘improved’ in order to make is understandable to the ears of each generation of listeners. The marine aspects can be discounted as such adjustments and not too surprising either. However the landing near Mount Ararat as their initial area of settlement now makes good sense. All lowlands and obvious places of initial settlement still would need centuries of natural restoration before much would be attempted. Populations of hunters would still be prowling the countryside creating security problems. These behooved creating initial settlements in sheltered highland valleys away from game herds where agriculture could be nursed into existence. Game herds would have recovered quickly as would their human predators. Lowlands needed to reestablish new soils and to also possibly be leached by centuries of rainfall. In any case, I will now insert some notes in the following text to assist you in understanding this thesis. 1 When men began to increase in number on the earth and daughters were born to them, 2 the sons of God saw that the daughters of men were beautiful, and they married any of them they chose. 3 Then the LORD said, "My Spirit will not contend with [a] man forever, for he is mortal [b] ; his days will be a hundred and twenty years." The Nephilim have received prior notice by other writers. In our reconstructed history it is easy to see them as ET, since they are again the space form of humanity in our reconstruction. This is confirmed by the fact of intermarriage taking place. Yet the text is certainly describing a superior and visibly unique class of humanity that appears outside normal tribal interchange. After all, why are they commenting on the mere fact of intermarriage at all unless it was exceptional. This is surely a priestly interpolation and brings in the subplot of divine punishment. The reasons for the flood had everything to do with terraforming the Earth in order to expand the human habitat on Earth by ending the Ice Age. c] wood; make rooms in it and coat it with pitch inside and out. 15 This is how you are to build it: The ark is to be 450 feet long, 75 feet wide and 45 feet high. [d] 16 Make a roof for it and finish [e] the ark to within 18 inches [f] of the top. Put a door in the side of the ark and make lower, middle and upper decks. 17 I am going to bring floodwaters on the earth to destroy all life under the heavens, every creature that has the breath of life in it. Everything on earth will perish. 18 But I will establish my covenant with you, and you will enter the ark—you and your sons and your wife and your sons' wives with you. 19 You are to bring into the ark two of all living creatures, male and female, to keep them alive with you. 20 Two of every kind of bird, of every kind of animal and of every kind of creature that moves along the ground will come to you to be kept alive. 21 You are to take every kind of food that is to be eaten and store it away as food for you and for them." First off, we can forget about cypress wood, and 450 feet and pitch. These are all Bronze Age word replacements long after any original meanings were lost. This was an ellipsoidal vessel containing three decks so scale remains more or less intact. The layering with pitch can be interpreted as graphene layering as described in my article about reengineering the UFO. Graphene is integral to a magnetic field exclusion craft. This vessel could stock a huge embryo inventory and all that is needed to establish a new settlement base. Maybe we need to call large UFO’s Arks. It could also travel through space to space habitats to bring people in and out. In fact this vessel could possibly carry between five to six thousand people in a passenger configuration. It is twice as long and twice as wide as a 747 and has three decks. If it was not a one off trip, then this is an excellent vessel to do the job described in the text. One could establish a fully populated colony in an attractive valley with a population mass able to scare off interlopers. a] of every kind of clean animal, a male and its mate, and two of every kind of unclean animal, a male and its mate, 3 and also seven of every kind of bird, male and female, to keep their various kinds alive throughout the earth. 4 Seven days from now I will send rain on the earth for forty days and forty nights, and I will wipe from the face of the earth every living creature I have made." Please take note of the ages been reported here. We are today on the verge of uncovering how to extend human life to these types of ranges. This merely confirms the nature of the Nephilim. These early settlers were able to retain their lifespans, during the first few centuries of the build out. I also want to put the idea of population in perspective. If we start with an initial pool of 10,000 settlers who are all pioneer growers, their main source of wealth would be children. Thus maximum fertility can be assumed. Then we have a first generation population of about fifty thousand, a second generation of another 250,000 and a third generation of 1,250,000, all easily within ordinary lifetimes. The first and second generation of leaders covered a thousand years. During that time their descendents would have had the opportunity to penetrate every valley in Eurasia and to populate it with agriculturally based humanity. Yet institutional memory remained fully intact and ample technical support was likely available to help establish crops. For whatever reason, there is little evidence that metallurgy was initially brought along, although that may be totally mistaken. If I have learned anything, in a primitive agricultural society, metal is money and simply does not get lost. Millennia of real metallurgy can all disappear into last night’s melt and will. We have the case of South America in which the only bronze artifacts merely precede the conquest. Yet the mining activity itself is easily millennia old. The crust moved and the ocean came on land. The impact of the comet filled the sky with carbon soot and valorized huge amounts of ice saturating the atmosphere with water vapor. The atmosphere itself warmed up several degrees at least. Then it all started to come out as rain and obviously rained for weeks on end. Curiously enough, this is a description of the Maldives, but is likely unrelated. The foregoing is hard to interpret because we simply do not know their perspective. One thought that does come to mind is an eyewitness report of the earth itself as the clouds of water vapor and even carbon dust dissipate. In short, this is more easily understood as sitting on a mountain height waiting for the ocean of cloud cover to fully subside. Certainly huge amounts of drainage would be ongoing both in the early stages and centuries afterward such as the lake whose eruption formed the Ganges a millennium later. Please observe the remarkable use of the verb to lift to describe the movement of the ark. This was no boat as depicted ever since. 15 Then God said to Noah, 16 "Come out of the ark, you and your wife and your sons and their wives. 17 Bring out every kind of living creature that is with you—the birds, the animals, and all the creatures that move along the ground—so they can multiply on the earth and be fruitful and increase in number upon it." a] every inclination of his heart is evil from childhood. And never again will I destroy all living creatures, as I have done. This following passage could well be another later interpolation and matches the style of later material. a] to plant a vineyard. 21 When he drank some of its wine, he became drunk and lay uncovered inside his tent. 22 Ham, the father of Canaan, saw his father's nakedness and told his two brothers outside. 23 But Shem and Japheth took a garment and laid it across their shoulders; then they walked in backward and covered their father's nakedness. Their faces were turned the other way so that they would not see their father's nakedness. and may Canaan be his [d] slave." The use of the verb 'to lift' is extraordinary and utterly wrong for a water borne vessal, yet it passed down to us. Also, magnetic exclusion vessals are best operated at high elevations because a lot of energy would be needed to bring them down to sea level. Thus the initial landing on the high peaks is very much in order and now makes total sense.